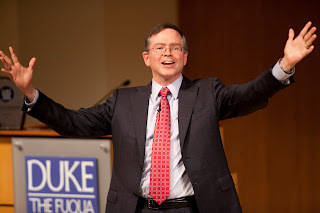 Last October, I had the pleasure and honor to visit the Center for the Advancement of Social Entrepreneurship (CASE) at Duke University’s Fuqua School of Business, to accept on behalf of Benetech the 2011 CASE Award for Enterprising Social Innovation (ESI). The ESI Award recognizes outstanding individuals and organizations whose innovations blend methods from the worlds of business and philanthropy, and that challenge the status quo to create sustainable social value with a potential for large-scale impact. CASE launched the ESI Award in 2009, and Benetech is proud to join the company of past award recipients. CASE is a research and education center that promotes the entrepreneurial pursuit of social impact through the adaptation of business expertise. Since its founding in 2002, CASE has been at the forefront of providing thought leadership for the growing field of social entrepreneurship. Social entrepreneurship is a new field whose actors will all benefit from a systematic search for best practices for developing, sustaining, and scaling innovative and effective responses to social needs. In particular, CASE is a leader in a movement to create significant social impact by exploring the broad new landscape of organizations and methods that seek to produce social benefits. This landscape, named by scholars as the “new social economy,” is being dramatically reshaped by recent trends in the social sector that have led to a blurring of the distinctions between business, nonprofit, and government organizations. Benetech operates at the heart of the new social economy, as illustrated by our innovative approach to picking up ventures that can make revolutionary impact on the social sector and by our business model that hinges on “building the last social mile” to fill the gap between what’s possible and what’s profitable with technology. We are grateful for CASE’s recognition of Benetech's work. As part of receiving the ESI Award, I was thrilled to deliver the 2011 Annual ESI Lecture and to meet the Fuqua School’s community. CASE offers a tremendous program for MBA students and alumni interested in applying their business skills for social purposes. I hope that in my lecture, I convince my listeners, especially students, that they don’t need technology degrees to succeed in high tech. I am also hopeful that the Benetech story inspires students to harness their unique skills, incredible creativity, and all the new technology at their disposal in order to create groundbreaking solutions that solve intractable social problems and serve all of humanity, not just the top 10 percent of the population. Second year MBA student and CASE Fellow Joanne Sprague wrote a thoughtful blog to reflect on my visit with CASE, where you can also watch the full video of my ESI lecture. What I like most about events like the lecture at CASE is the opportunity to meet with brilliant students, who will be developing amazing, cool ventures just a few years from now and who are already brimming with exciting ideas and plans. Among the meetings and discussions I enjoyed at CASE was a conversation with a group of MBA students interested in helping NGOs that are working to advance the rights of lesbian, gay, bisexual, transgender, and intersex (LGBTI) individuals. Joanne, for instance, shared with me her concept, which she plans to pursue full-time after her graduation, of a social venture to engage straight allies in the LGBTI rights movement. I was delighted to hear Joanne’s thoughts and to share some insights and lessons learned from the work that the Benetech Human Rights Program is doing to build the capacity of LGBTI-rights focused NGOs in Africa and the Caribbean. The CASE ESI Award recognizes Benetech’s position as an influential leader in applied technology innovation among nonprofit and social enterprise organizations. To us this entrepreneurship-infused leadership position means that we must keep our commitment to help build the field of social entrepreneurship and support the movement that is generating hundreds of technology social enterprises. True to this commitment, I draw tremendous satisfaction from mentoring new social entrepreneurs, finding resources for them, and helping them avoid the pitfalls that I had experienced. In such connections – with students, academics, technologists, and other governmental and nonprofit organizations – lie the seeds of countless ideas for using technology for social good, which we see as a fundamental part of Benetech’s continued success. Thank you for your inspiring words and the great work you do for the field of social entrepreneurship. It was our honor to host you at Duke and the students have not stopped talking about what a great experience it was for them to meet with you and be inspired by your/Benetech's work. Thank you and come visit us again soon!